The Black History Month Trivia Challenge is a fundraiser dedicated to celebrating contributions from members of the African Diaspora to the fields of Science, Technology, Engineering, and Math. 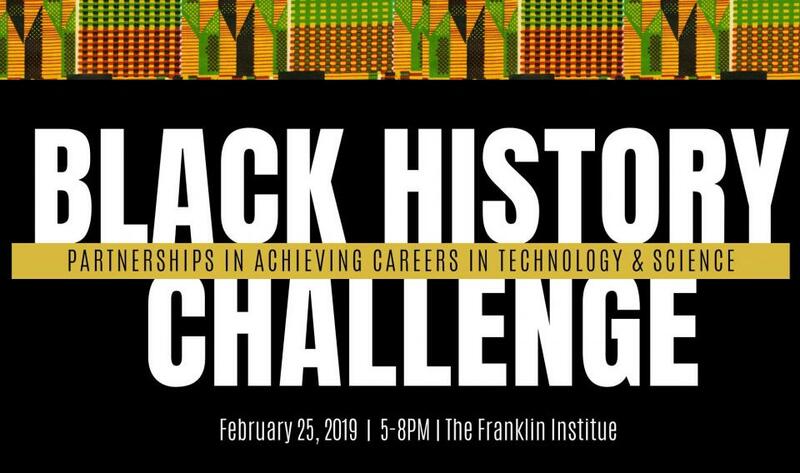 In collaboration with The Franklin Institute, the Alumni Association for the museum’s youth leadership program, Partnerships for Achieving Careers and Technology and Science (PACTS), will host the 1st Annual Black History Challenge to raise funds for youth programming, initiatives, and scholarship. This game show style contest will be hosted during Community Night, a special monthly event at the Franklin Institute where museum admission is FREE for all visitors after 5pm. It is a great opportunity to celebrate Black History, while supporting the future generations of leaders in STEM. Think you’ve got what it takes to compete? Round up some friends or colleagues and join in on the fun, while celebrating Black History and supporting the next generation of scientists and engineers. It takes a village to build the future! Winning team will take home a trophy and the title as the black history challenge winners to carry into next year’s event! Teams will receives the questions upon registration and have enough time to prepare for the day of the challenge. Registration limited to 10 teams! Registration Deadline in February 15, 2019, or when full. Didn’t study hard enough this year? Join us anyway to cheer on the teams from the audience and be eligible for door prizes! You can still support our efforts with a donation to the PACTS Alumni Scholarship.